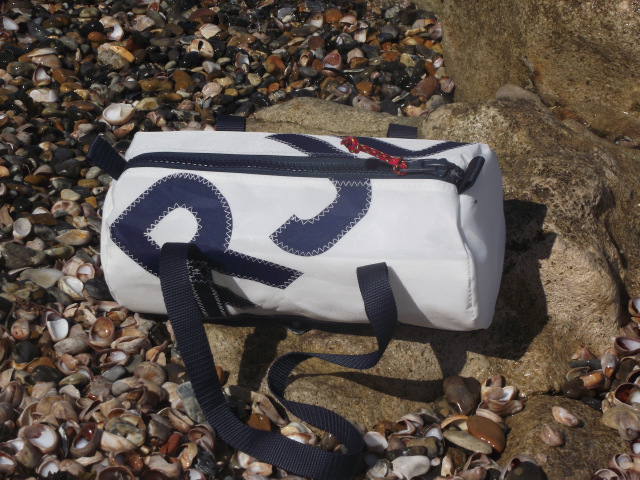 This Barrel handbag is made with white sailcloth. It can be worn over the shoulders or carried. It is surprisingly spacious and is perfect to take sailing and cruising. It looks equally stylish in town or at a sporting event. It is extremely lightweight and practical. We can personalise your bag with up to three initials or numbers in a variety of bright colours as well as having a choice of zip and webbing handle colours. Wash by hand with soap. Dry naturally. Please do not tumble dry, do not dry clean and do not add bleach.